Safety is an attitude and is our first priority in everything we do. We enforce a drug free work place policy, and our employees must go through a detailed training program and on the job training. Each operating day prior to opening, every ride is inspected by the ride attendant and re-inspected by our Safety Coordinator. Weekly Safety Meetings are held to reinforce, refresh, and go over any updates or concerns of our safety policies. All ride attendants are trained and receive a rating based on their training level. Our training guidelines are as set forth by the O.A.B.A. (Outdoor Amusement Business Association). We want you to be fully confident with Fantasy Amusement Company, Inc. attitudes concerning safety. We set ourselves apart from our competition simply because we employ the services of a professional safety inspector. The inspectors responsibilities include inspecting all the equipment routinely and conducting training sessions for our employees. This is all in addition to our weekly inspections in each community, plus state inspections, and our daily pre-opening inspections. Bill Johnson was one of the first members of NAARSO and is a member of ASTM (American Society of Testing Materials). Fantasy Amusement Company, Inc. was awarded the Circle of Excellence rating by the OABA and we have sent staff members to NAARSO training (National Association of Amusement Ride Safety Officials). In February, Bill, Ivan and Vincent all attended the NAARSO training session held in Orlando. Each year all of our equipment is inspected by the Illinois Department of Labor, State of Indiana and the City of Chicago prior to opening the season, and then periodically when ever the State chooses. In addition each week our equipment is inspected by the city or town we are working in prior to opening, plus we ourselves do a daily pre-opening inspection. All of our ride personnel have been trained by a Safety Consultant on safety, operations and maintenance. Each year we provide these seminars for our staff; to refresh our returning employees and to educate new personnel. These seminars are held multiple times during each season. Our Maintenance program is continually being revised and reviewed. Our equipment costs are so high, it is in our best interests to make sure we keep everything properly maintained. After setup each week, One full day is used just for maintenance and to make sure that the rides are not only performing correctly; they are cleaned and polished so they look great too! A daily maintenance routine is performed prior to opening each day. This maintenance is confirmed during our daily pre-opening inspection. In addition to being inspected and maintained by trained personnel, our equipment is regularly inspected by our insurance carrier. Our equipment is also subject to various inspection programs involving non-destructive test methods such as Ultra Sound Testing, Magna flux Particle Testing and various x-ray testing of hidden components. All inspections are welcomed because they have helped us obtain our high safety rating. 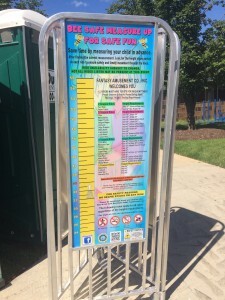 We are proud of the fact that Fantasy Amusement Company, Inc. has always been rated as one of the safest amusement companies in our area. Our warehouse facility is located in Peotone, Illinois. There we have 5 acres of land consisting of 2 buildings. One building of 10,000 square feet is devoted to maintenance and repairs. Each ride is brought in and thoroughly gone through repairing and/or replacing everything needed from the light bulbs to total refurbishing; whatever is needed is done. Each ride looks and operates like its brand new after going through winter quarters. There is also a storage building to keep the rides out of the elements during the off season. The Saferparks Kids Club gives kids and parents a fun way to learn about ride safety before visiting an amusement park or carnival.